As a little girl I loved all things elegant and all things dainty. I was quite the girly girl, a trait which my mother indulged a bit. Every once in a while she would take my sister and I to high tea at the Adolphus Hotel in our hometown of Dallas. In the elegant sitting room, we perched on the silk and damask sofas, practicing our best manners and enjoying acting like grown ladies with tea cups balanced in our little hands. I'm not a little girl any more, but my love of high tea and all things fancy carries on. The other day as I was working away in my room at The Merrion in Dublin, I was overcome with the desire for a pot of tea... and then I saw that I could have tea with all of the trimmings delivered to my room. Clearly, that was the choice for me. Room service delivered a darling little table trimmed with a silver tea service and the hotel's signature china. 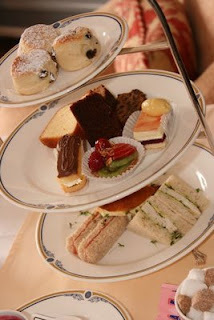 The menu varies daily but always includes the high tea basics: finger sandwiches, scones, sweets, and tea. If you are not staying at The Merrion, you can still have the high tea experience. Heated with peat-burning fireplaces, the three drawing rooms on the first floor are cozy and charming, and you get a sense for the Georgian majesty of the entire hotel. Each afternoon the drawing rooms were full of people sipping tea, and I even spotted a few mothers with their daughters engendering a love of tea in yet another generation. Where have you had high tea? Are you a devotee as I am? Thanks to all of you joining me from WanderFood Wednesdays! I love tea, also, Angela! The frou-frou-ier, the better. I love it! High Tea is an indulging, isn't it? 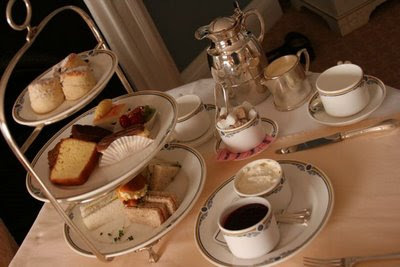 I enjoyed High Tea recently in Victoria, BC, and thoroughly enjoyed the service, the delicious tea and all the finger food!